The night of February 19/20th 2009 provided me with my best view of C/2007 N3 Lulin to date, simply because it stayed clear for much of the night. I was actually observing this comet on and off at regular intervals for six hours and by the time the session ended before dawn I was well and truly ready for a warm bed. The night was clear, dark, and calm. However, the most horrible frost in a long time stayed with me throughout the night and made observing not only challenging but extremely uncomfortable. Despite being suitably clothed I was physically shivering to the extent that my hands and legs moved up and down on their own. I could see the comet rise above the horizon murk during the late evening but the best view took place between 00.00 and 01.30 UT. 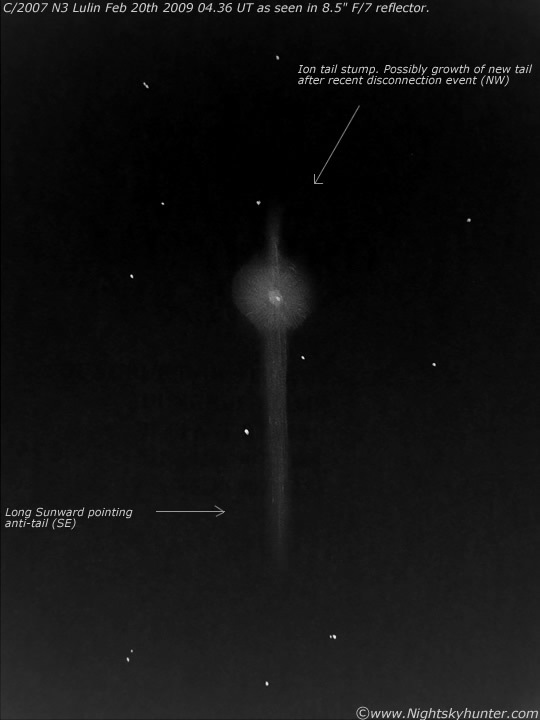 At that time I was chatting over the phone with local astronomer John McConnell and together we observed the comet from our own back gardens at the same time which was fantastic because we could confirm what we were seeing, and exchange our thoughts and impressions of the comet at the same time. It's great to be able to share a bright comet with someone else who is just as fascinated by these visitors as much as I am. I was using 10x50mm binos and had the camera set-up. John had done likewise so we observed and photographed the comet at our leisure while occasionally remarking on other things like Saturn and any Iridium flares or meteors which briefly interrupted the serenity of the sky. The real highlight came when we both observed Lulin at the same time quite easily with the naked eye!. Even while casting a casual glance with the dark adapted eye towards Virgo you could see a large fuzzy patch of light below the naked eye star Porrima. The comet was a few degrees to the S of this star and shared this relatively blank area with a few others stars near the limit of vision. I could detect a subtle green colour and even the central condensation (CC) without optical aid. We could even see the comet with direct vision with ease. In the binoculars the coma was a beautiful object sporting a strange and vibrant green colour with a glorious white CC which looked like a bright star. It was difficult to describe the silent beauty of that glorious comet perched against a background of dark sky complimented by a scattering of stars. With the binos shaking in my shivering hands other features soon popped into view. A long faint ion tail and a much brighter anti-tail which took up a large portion of the 5 degree FOV. Based on the naked eye view I would estimate the comet at mag +5.3, however I'm being conservative because I still feel it could be brighter than this. Later, during the coldest period of the night I could see the comet sitting proudly on the meridian and at it's highest point in the sky directly S. Lulin, Spica, Saturn, and the Beehive cluster made for a splendid naked eye sight. I then turned the 8.5" F/7 reflector on the comet and observed for a long time. This was when I noted that aperture effect was really playing a large role on the visual profile of this comet. In the SWA 32mm eyepiece the ion tail was extremely faint, really just a stump of faint grey light which I could only detect extending for 25' in the scope. I was convinced that after a recent disconnection event that I was actually witnessing a new ion tail unfurling from the coma to replace the old one which was probably some distance 'down wind'. The anti-tail however was much brighter with a well defined edge and seemed more substantial in profile. I could track it for at least 1 degree before it blended in with the sky. The coma was a huge elliptical fuzzy patch enveloping an intense CC with a bright star-like false nucleus which was very easy to see. The above sketch made at 04.36 UT shows the view in the eyepiece at that time. Eventually the bitter temp and recent lack of sleep took their tole so I decided to end the session at 05.30 UT. It was a great night, and currently my best memory of comet Lulin to date.